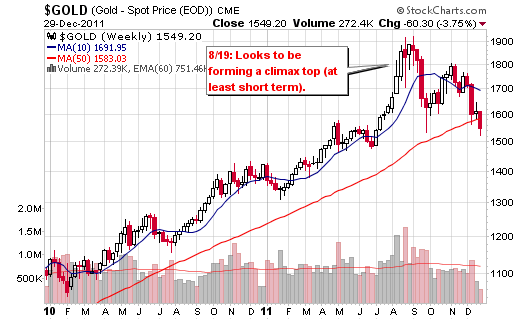 August 21, 2011: A Gold Climax Top? 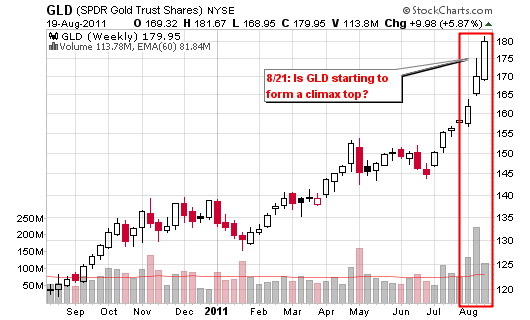 Signs are pointing towards a possible climax run for $GLD but please note that this may only be the beginning. 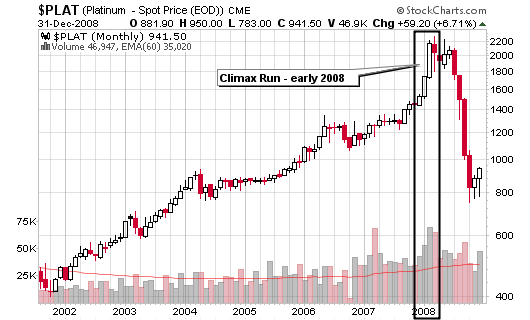 Climax runs can push stocks and commodities to extreme levels with parabolic shapes at nearly 90 degree take-offs. 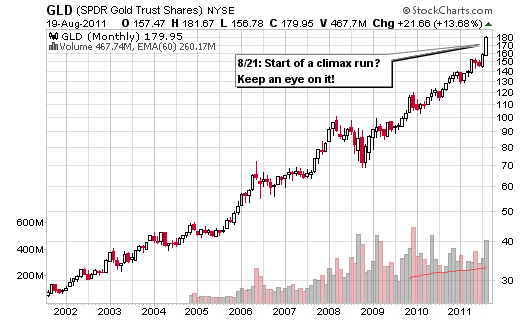 Gold is starting to make a similar run, right now! Well, Gold is now off 16% from that climax top post in August and more than 19% from the ultimate top which is within 1% of a confirmed bear market for the metal. 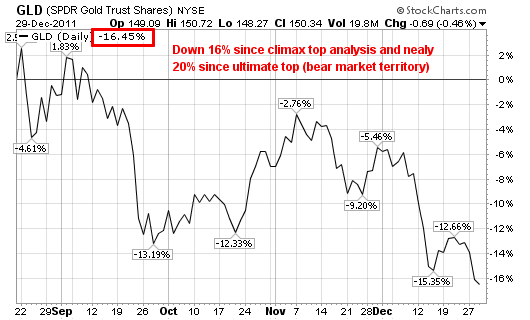 More important is the recent chart pattern which resembles a Dow Theory Breakdown or 1-2-3 breakdown. 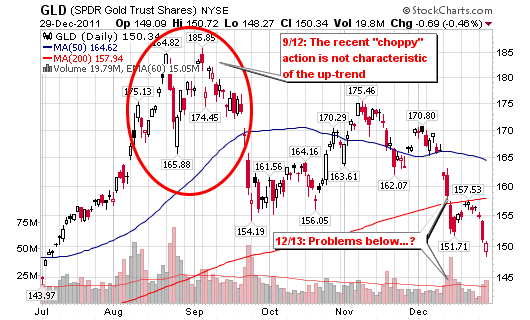 This pattern suggests that Gold has further downside. 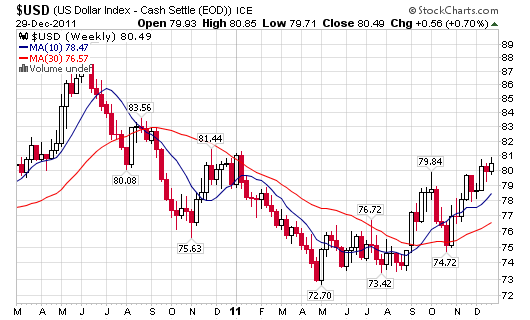 I don’t know what 2012 will bring but for now, I continue to remain bearish on Gold, especially considering the strength in the US dollar. With that said, this is the market and things can change in a day so stay tuned to my daily twitter updates (featuring charts and 140 character analysis). 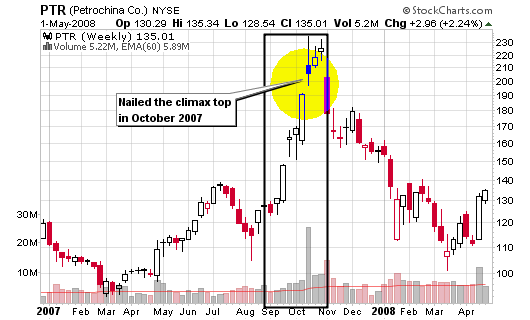 I have nailed several climax tops in the past and will use two prominent examples to highlight the extreme runs they made before dropping hard. 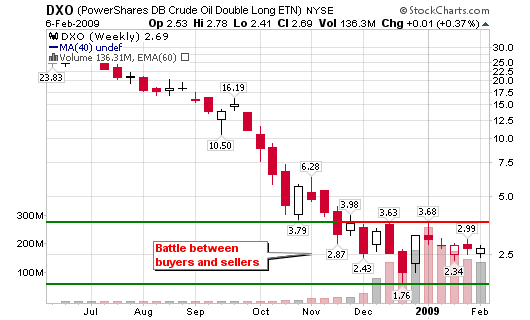 These examples will also show us what to look for when selling into exhausting strength and possibly taking the opposite side of the trade on the down side. 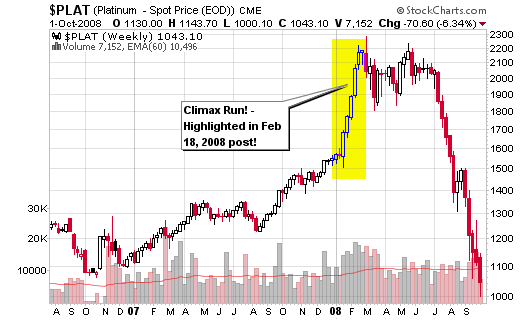 Both Platinum $PL_F and PetroChina $PTR formed climax tops that I highlighted in real time on the blog back in 2007 and 2008. 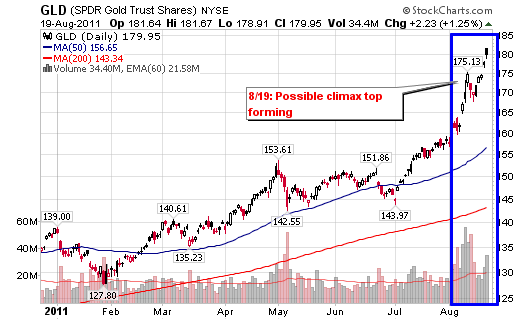 I started to notice both climax tops early in the run so use that information when analyzing my take on the current $GLD chart. 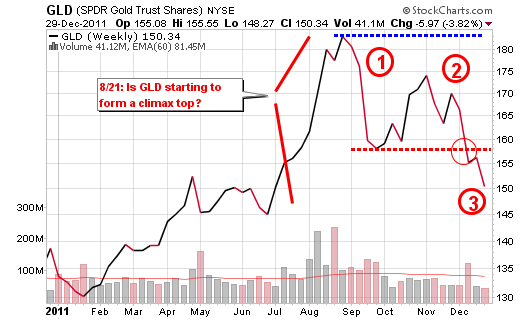 I am most likely early and I feel that gold may have more rebound power if it does start to drop. What do I mean? 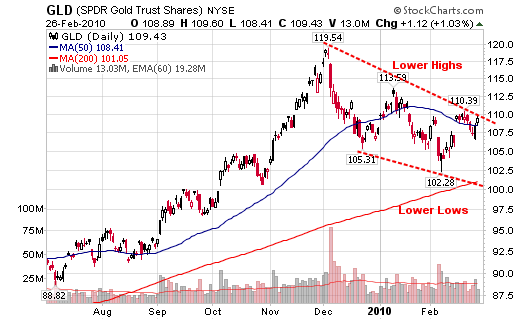 I mean that Gold may drop hard (short-term), only to find support and then resume its up-trend. I don’t know if Gold will fall apart the way that Platinum and Petrochina did a few years ago because the global economy is in bad shape and humans have been programmed to turn to the shiny metal as protection against “all things bad” – such as fiat money, recessions and depressions, etc. What catches my eye is the extreme run-up over the past two months as the metal seems to be making a climax run (out of character during the 10-year up-trend). Similar action started to happen in PTR and I highlighted it in the exact manner as I am doing here with $PL_F in a post titled The Real PTR Climax Run. 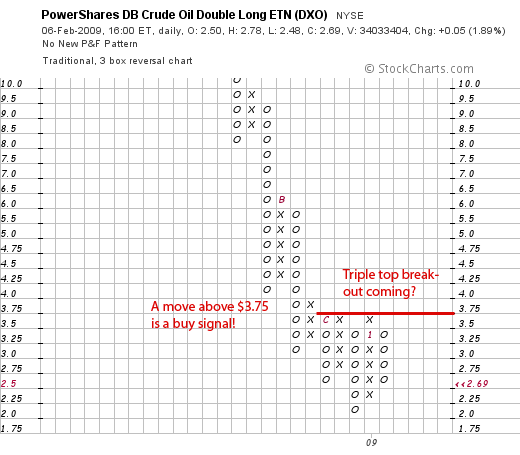 …the HUGE volume on the latest push to new highs clearly indicates something is going on. 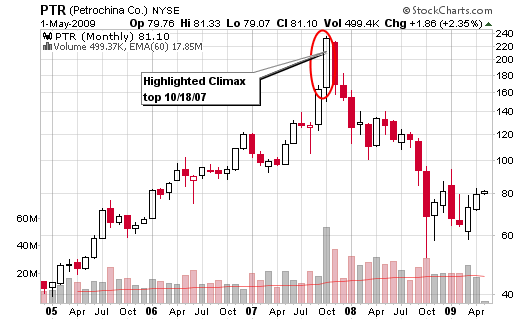 …a climax top is where the stock has advanced for many months and suddenly races up for one or two weeks much faster than any prior one-or two-week period or since the beginning of the stock’s long move up. 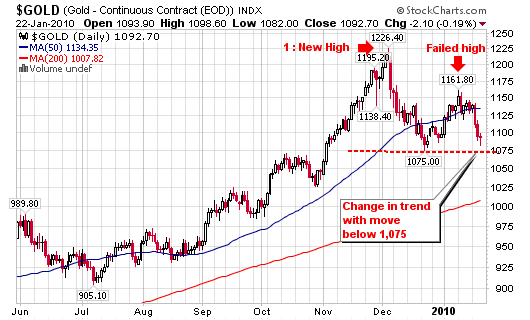 Gold looks to be reversing, the confirmation is a move below $1075.00. 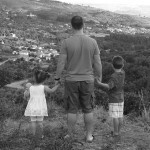 A drop below that number could take it towards $1,020.00 and then $1,000.00. How did I determine that? 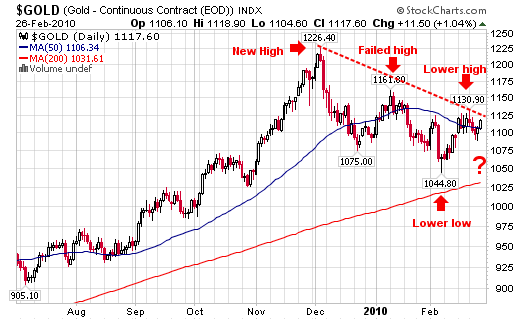 A new high, a failed high and now a challenge to the minor low (see chart for visual). 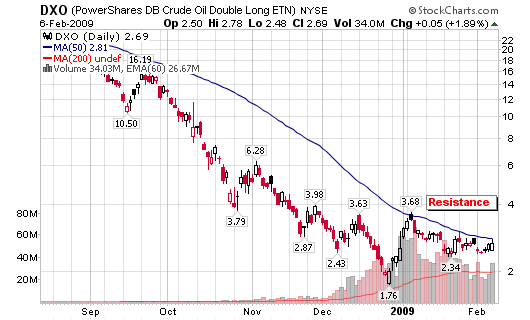 It’s essentially a Dow Theory reversal setup.